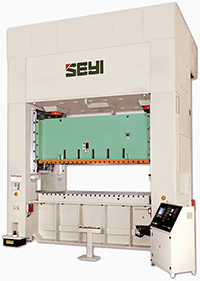 The SAG Two-Point Straightside press offers a versatile solution for general purpose stamping. Unitized or tie-rod frames are designed with ultra wide connection points. A Wintress/SmartPac 2 control system easily integrates automation functions including tonnage monitor, die protection, programmable cams and job memory.